Trained as an oil painter at the School of the Museum of Fine Arts, Boston, Carol Odell has worked in commercial design, textiles and photography. 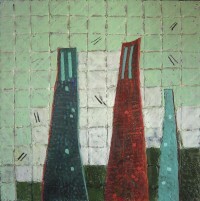 Her improvisational, non-objective, color-expressive works are created in oil, encaustic, or monotype. Beginning with a non-representational structure, she builds paintings with an eye to creating an imagined space with non-specific references to the natural world. Recently she has given workshops at the Cape Cod Museum of Art, the Cape Cod Art Association, Kutztown University, as well as in her Chatham studio. She is a member of and participates in group exhibitions with the Printmakers of Cape Cod, the Monotype Guild of New England, 21 in Truro, International Encaustic Artists, and Mass Wax. She is included in Encaustic in the Twenty-first Century by Anne Lee and E. Ashley Rooney and Deborah Forman’s book, Cape Cod Contemporary Artists/ On Abstraction. She and her husband, metal artist Tom Odell, have owned and operated Odell Studios Gallery in Chatham for over 40 years. 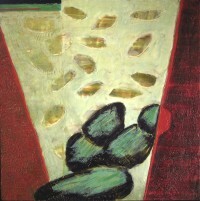 Her works are in private, corporate, and museum collections.